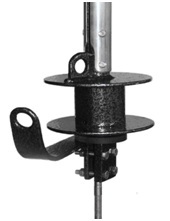 The Trailer Sailer Furling System designed just for trailer sailers or small sailboats to withstand the most rigorous demands and requirements of today's cruising or racing sailboats. The trailer sailer furling system allows you to reef (partially deploy) the sail in strong wind conditions, this means your Large Genoa can be reduced (reefed) with a trailer sailer furling system to become a Jib, Storm sail or anything in-between. The trailer sailer furling system is not only better suited to the lone sailor, it is much safer, as the trailer sailer furling system can be operated from the safety of the cockpit, the sail can be reefed in a matter of seconds or completely rolled up when a squall approaches. We always have stock on hand and our trailer sailer furling systems are dispatched within 24 hours of receiving your order.